Our neighbor and friend’s dog had to be put down this week. It is an enormous loss to our friend, the dog was 14 and she got the dog as a puppy. We knew the dog it’s entire life, too, living next door. 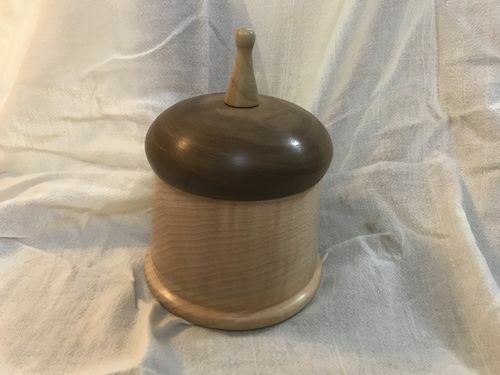 Body is figured maple, lid is walnut and the finial / knob is apple. The branch that birthed the finial was from the neighbor’s old apple tree, which died 5 years ago. I saved some of the wood for some unknown reason; now I know one of the reasons. Rest in peace, Kari Dog. I am turning 50 in 2019, so I am turning 50 projects and documenting that journey.